at the Monaco Yacht Show 2014. For the first time, visit the most beautiful superyacht ports and coastlines through Google Street View, taken from the water. Would you like to be the first to hear when we add new ports and try out new features? Subscribe to Portview updates and we'll let you know. Head on over to portview.gallery and start exploring. There are thousands of panoramic images in the ports of the Cote d'Azur that will give you a good idea of what it'll look like. During the Monaco Yacht Show, we will be around every day and you can even experience this imagery in an immersive Cardboard VR interface if you'd like, we brought a bunch for you to play with. Just contact us and we'll make it happen. We will be adding more ports and more countries real soon. We partnered with an exceptional team at Google in the headquarters in Mountain View, California, to make this happen. 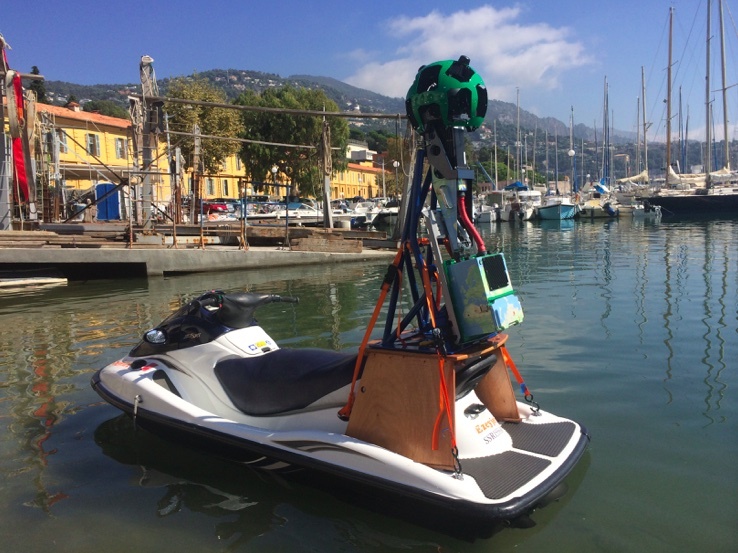 Unlike traditional Street View, we had to learn how to do this efficiently and get the special permits to take jetski's to forbidden bays and ports. During this first stage of the project we ran into some very exceptional challenges, including a great white shark coming to visit the Jetski. Buy us a drink and we'll happily share the whole story. During the summer of 2014, we collected images in a couple dozen ports in the South of France and Monaco, with the intent to showcase the technology, build a great product on top of it and then scale the project worldwide, which is what we are currently doing. Anyone who takes a boat to a new port has the same questions. What does it look like? Where do I turn? Are there big scary ferryboats at the entrance? Where is the capitainerie? Professional yachting crew immediately see the value of Portview but business owners and recreational yachts will benefit just as much. We are currently building tools and products on top of this imagery, which is freely available to anyone, and can't wait to see what people build around it. Image of Fontvieille, Monaco, used with permission, under license.